There are quite a few cardigans I love in Alannah Hill (it’s completely unrivaled when it comes to cardigans, in my opinion), but this one is definitely my favourite. It’s such a unique and pretty shade of blue. I love the collar design which is made up of little pearls. I’m keeping an eye out and hoping this lovely cardigan will come on sale very soon. I’m a huge fan of the Dita Cardigans from Wheels and Dollbaby but only have two in my collection so far (some of the crazy fans out there have all 22 colourways!) The last two colourways released didn’t appeal to me. However, last week it was announced a lavender version of this cardigan will be coming out shortly. I am so excited because I wasn’t expecting it, and purple is one of my favourite colours. The shade is absolutely beautiful and I adore the way the black embroidery stands out. I’ve already pre ordered it. As I’ve mentioned a few times now, I’m totally in love with B.A.I.T Footwear and the Robbie Heels are one of my favourites. See post on my collection here. I now have this exact shoe in four different colours which is rather excessive but I’m sure I’ll think of an excuse as to why I need it in six different colours! I was very happy to see it’s now also come out in sparkly green and sparkly purple. These shoes would add so much to any outfit; I don’t see sparkly shoes too often. I love the vintage design and they are very comfortable too- a perfect shoe! I recently discovered the UK brand HydrateM8 and this range of water bottles. 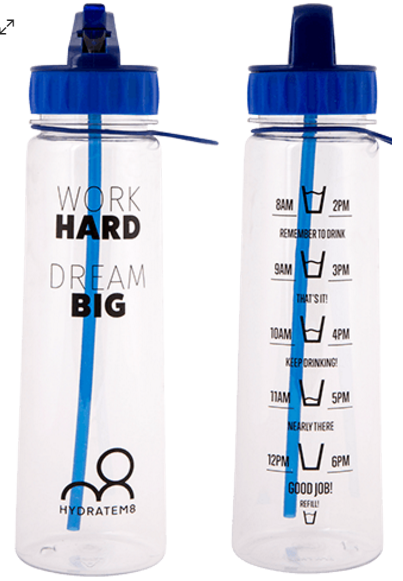 This bottle shows the required level of water consumption in hourly intervals throughout the day. It’s such a simple concept yet I think it would be very effective and add a little fun to the day. I’m going to buy one of these. Once again, Alannah Hill does not fail to disappoint when it comes to cardigans. I want so many from there right now. This is a new release so unfortunately I don’t think it will be coming on sale any time soon. I am completely drawn to snowflake. It’s so adorable and not something you see on clothes all the time. I have a slight preference for the navy blue version but love them both. I have just bought a pink Michelle Bridges water bottle from Big W it has the times on it as well. It is making me accountable for my water consumption, cause I never drink enough. Oh my goodness, you have chosen some Amazing items here!!! They are so gorgeous, the coats and the cardigans and the green sparkly shoes are gorgeous!!! I have a little white furry collar just like the ones on those coats that I bought in the sale for £5. It really does pep up a plain look! I bought myself a glass water bottle because I'm trying to avoid plastic where possible! So beautiful items, dear Imogen! I vote for the Kitten D'Amour blue/mint coat, although you have two other coats in pale blue – but that one is so lovely, how can someone resist? I also loved the Alana Hill cardigan and the B.A.I.T. shoes, in purple or green, both are fantastic and I can't decide myself… maybe the two pairs! Hope you are enjoying the week and that you have a lovely weekend! OMG! Loving that Tiffany coat! So completely adorable! I love the little contrasting red bow!!! Too cute! 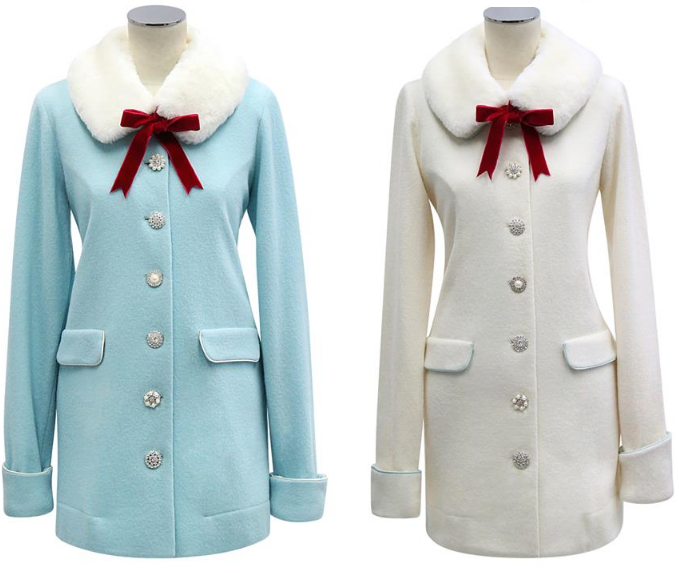 Those coats are just darling! I can totally picture them on you! Those cardigans are lovely and chic.